Melloy Dodge: Get Ready for the 2015 Dodge Challenger Hellcat! Get Ready for the 2015 Dodge Challenger Hellcat! Melloy Dodge in Albuquerque invites you to drive one and test those claims yourself this fall—we think you’ll agree! The new 2015 model boasts 707 hp and 650 lb-ft of torque with an eight-speed TorqueFlite transmission, rated to handle 738 lb-ft. During its design, the Challenger SRT Hellcat spent 35 percent more time in the wind tunnel to allow it to achieve maximum aerodynamics. With the 707 hp, we think that’ll help its stickiness to the road! Chrysler says the car’s V8 engine is the most powerful it’s ever produced. That says something. In its design, the driver’s side parking lamp was actually deleted to allow an air catcher cold-air intake. That gives the supercharged HEMI deliver horsepower and torque that’s truly in a class by itself. Choose a Tremec 6-speed manual or TorqueFlight 8-speed automatic engine. Shock absorbers are gas-charged and adjustable, allowing the driver to set their choice, increasing rebound and compression rates for maximum handling feel. A 20-inch aluminum wheel package sets the tone on the road. And in your hand—the choice of which key to use. The Hellcat engine comes standard with two key fobs — red and black. The red key fob is the only key that can unleash the full 707 horsepower and torque potential of the Challenger SRT Hellcat’s engine. The black key fob limits the driver to a reduced engine output of “just” 500 horsepower.Choose your key, choose how fast you’ll be blown back into your seat. The all-new interior is inspired by the classic 1971 Challenger. The instrument panel features a stamped aluminum bezel, which sets the tone for the driver’s display. An innovative 7-inch driver-selectable driver information display (DID) screen is centered in the gauge cluster and provides an extremely customizable display. The all-new DID screen is flanked by new analog speedometer and tachometer gauges, providing a heritage-inspired look with concave shapes and a hub-covered needle design, reminiscent of the “tic-toc-tach” gauges from the 1971 Challenger. For the Challenger SRT with the Hellcat engine, the fixed gauges and digital graphics are finished in a Dark Radar Red tone to make it even more unique. The dashboard’s center stack houses the new standard 8.4-inch Uconnect touchscreen. Drivers will be able to select one of many backgrounds to connect the digital look and feel with their chosen interior package. A new, trapezoidal shaped stamped aluminum center console provides Challenger SRT’s interior with a fresh look. Leather-wrapped surfaces and French-seamed accent stitching run along the console from the back to the front. An all-new media hub with an SD card slot, USB outlet and audio jack is neatly housed inside the center console’s flocked armrest. A redesigned SRT-branded heated steering wheel features a flat bottom for the high-performance driver. To make cruising even better, the new 2015 Dodge Challenger SRT features redesigned seats with improved cushioning and more comfortable contours, with large side bolsters for maximum lateral support in hard cornering. For improved comfort and convenience, new for 2015 are standard heated and ventilated front seats. 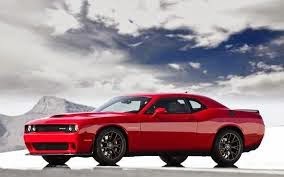 The Challenger Hellcat is expected to begin arriving at Dodge dealerships in late third quarter 2014. For information about when it will roll off the transport truck at Melloy Dodge, call and talk with one of our sales staff at 505-843-9600. We expect that each model we receive will quickly find a home with a lucky Albuquerque driver. Melloy Dodge on Coors, just north of Paseo del Norte, has been providing Dodge and Ram vehicles to New Mexico drivers for nearly 50 years. We believe we really can help you find the right car or truck, and we hope to help you purchase your next vehicle.